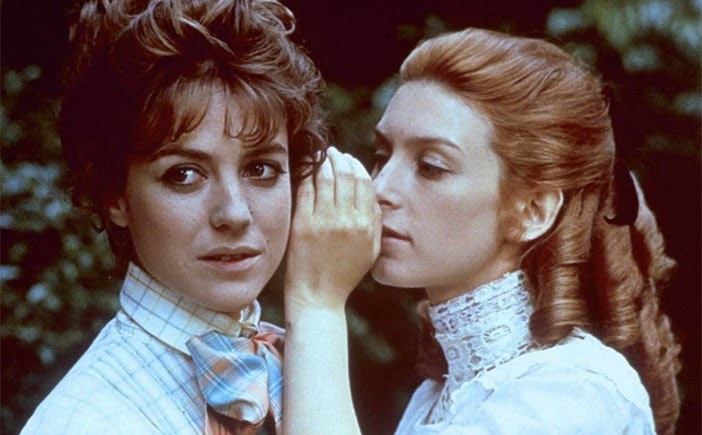 Truffaut’s Two English Girls (l971) which was revived at Film Forum’s Tout Truffaut retrospective is rather crafty. It begins as a nineteenth century novel in film form with an unreliable narrator of the kind one might find in Conrad, a generous use of the epistolary form and equally generous helpings of interior monologue. Truffaut’s liberal implementation of the iris and dissolve are part of the cinematic vocabulary for what at first seems like a period piece about unrequited love, say like the later The Story of Adele H (l975) Seeing the first hour or so of the Two English Girls based on, Two English Girls and the Continent, the novel by Henri-Pierre Roche, one thinks of the movie as a charming anachronism. Was Truffaut the Jane Austen of the New Wave? The nineteenth century novel was devoted to sensibility and the assertion of the inner life. One might say that it’s accomplishment was the invention of a certain kind of interiority that is more important today than the specifics of what that interiority actually comprised. During the course of the film the Jean-Pierre Leaud character, an art connoisseur named Claude Roc, writes a novel in which the two sisters he’s in love with, Ann (Kiki Markham) and Muriel (Stacey Tendeter), are turned into men. He could also have called it Jules and Jim (that film incidentally was also based on a novel by Henri-Pierre Roche). However, what soon becomes apparent is that the film is a wolf in sheep’s clothing which is to say that it’s determinately and uproariously modern. It’s not the Truffaut of The 400 Blows or even Jules and Jim, but far cooler, complex and more subversive. Rather than being the dewy eyed romantic Claude might better be described as an artistic decadent, a character out of the pages of Huysmans. He’s a believer in free love and an early collector of artists like Picasso, one of whose works is gently placed before our eyes as the camera pans his digs. The film plays with the dualities of French and English culture, with religion and free thinking, with repression and expression, yet the dour Muriel sends a confessional to Claude about her long life of masturbation, which he in turn would like to publish; the enlightened sculptress Ann turns out to be a soul murderer as well as procurer for her sister. Rodin’s sculptor of Balzac plays a cameo in the film and besides Huysmans he’s the one other l9th century novelist whose imagination could have accommodated all the selling of bodies and souls. There are lots of tracking shots in Two English Girls and also tracks. Truffaut is fascinated by the advent of modernity which takes the form of the train and an uncanny ability to subvert the expectations created by familiar iconography. Early in the film, before the director puts his cards on the table, we realize something is amiss when the standoffish Muriel tempts Claude, who in the first scene of the film takes a serious fall in which he hurts himself—with an apple.